With winter fast approaching, and with so few meetings run due to the late opening of the track, the club decided to take advantage of the long Easter Weekend by scheduling meetings for both the regular Saturday night and the Easter Monday afternoon, a move which proved popular with drivers and fans alike. A number of Auckland drivers made the long haul down to race at Waiwakaiho as the Western Springs season had already closed and their numbers could have been greater if the club had been able to afford the traveling costs. Foremost among the visiting Auckland drivers was Roly Crowther with the ex Frank “Satan” Brewer Ford V8/60 powered # 2 and this would give the Waiwakaiho faithful their first glimpse of a top class car driven by a very skilful driver. Roly had burst onto the midget car scene at Western Springs just after the war and in his first season, 1944/45, performed the remarkable feat of winning both the New Zealand Junior Championship for first year drivers and New Zealand Open Championship while driving the American built #3 car which had been brought here by Paul Lindskog in 1938. The following season he firmly established himself as the man to beat at Western Springs by winning the New Zealand Open Championship for the second consecutive season, again at the wheel of the ex Lindskog Rugby powered number 3 car. A few leaner years followed with Roly racing at the Olympic Stadium in Newmarket as well as at Western Springs in a number of different cars before he got the chance to drive the V8/60 powered # 2 car that he brought to Waiwakaiho. This car was by no means a modern state of the art racer, it had been built and raced back in the mid thirties by Ken Hupp around the Northern Californian tracks in America and had originally been powered by a Ford Model A engine cut in half, the Americans having a smaller maximum cubic capacity than that allowed here, and it had the usual pre war rail chassis. After one season racing at Western Springs in 1939 Frank Brewer had traveled to the United States to try his luck on the tough Californian tracks and purchased the Ford V8/60 powered car, which would carry his now familiar 99 on it’s tail, soon after his arrival there. Frank returned to New Zealand with this car after a year of racing in California and won the New Zealand Open Championship at Western Springs during the 1939-40 season at the end of which he again traveled to the U.S for another season of racing in California, taking the car with him. With another successful season in California under his belt Frank crossed the Pacific homeward bound once more with the ex Hupp car and competed at Western Springs where he again triumphed in the New Zealand Championship and then it was back to America for both Frank and the car as the clouds of war gathered and midget racing everywhere came to a halt. It would be the 1946/47 season before Frank Brewer would be seen racing on our shores again and for this visit he brought two cars with him, the older car which Western Springs fans were familiar with and a newer car built by former American driver Roy Richter, also powered by a Ford V8/60, which now would carry the number 99 while the older car would carry number 7 and be driven by Frank’s brother Ivan. A bad crash and severe injuries at Western Springs finished Ivan's career and when Frank returned to the United States the ex Hupp car remained in New Zealand in the hands of it's new owner, Aucklander Jack Malcolm, who raced it for two seasons on the Australian tracks and at Western Springs as number 2, with mixed success. This photo shows Dave Holmes in #57 leading Jack Harwood in #19 with Roly Crowther on the outside in his V8-60. Bill Cosgrove would be the driver of the number 2 car, now owned by Jack Lough, for the 1949/50 season at both the Olympic Stadium and Western Springs meetings and he too achieved reasonable results before retiring at the end of the season leaving the car available for Roly Crowther. 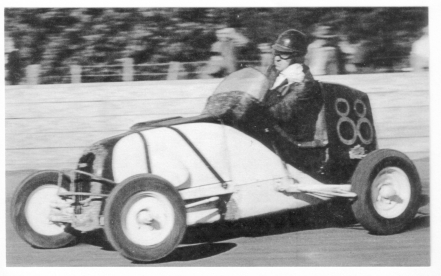 Also making a Waiwakaiho debut was Auckland's Warwick Lewis, who had several seasons of racing at Western Springs behind him, with number 88, a car that had been built by Ron Roycroft and Harry Chatteris just after the war. Making return visits for the Easter meetings were Aucklanders Beau Thornton in # 91, Ron Sutherland in # 31 and Bill Teixiera with the # 22 car. Most of the Manawatu drivers were absent for this weekend as was Roy Low but it still promised to be a weekend of Speedway at it's best. The spectators didn’t have to wait long to find out what was in store for them. Roly Crowther wheeled the # 2 V8/60 out onto the track for the first event of the night, a three lap time trial, and with an astonishing display of speed and skill left the old record in tatters and those that witnessed it almost in a state of disbelief. Over three and a half seconds had been slashed off the old time for the distance and in that brief time on the track he had won himself a legion of new fans. The second event of the evening was the Brooklands Handicap over the usual three six lap heats and a final. Beau Thornton got his night off to a flying start by bringing the # 91 car home ahead of Harry Williams in # 28 and George Amor in # 10 but it was the second heat that the spectators were impatient to see, for it would bring out Roly Crowther, and how quick would he be with traffic to contend with? Well, the answer was pretty quick in coming, Roly launched himself off the back mark to cruise to an effortless win from Theo Dodunski in # 13, and Bruce Boyd in # 4, who probably wondered what had struck them as the flying Aucklander sped by them with consummate ease. Dave Holmes triumphed in the third heat and would be joined in the final by second placed finisher Jack Lambie in # 1 while one of the few Manawatu drivers at the meeting, Fred Miles in # 15, came to the line in third place. The final saw a splendid drive from Beau Thornton in # 91, heading home Roly Crowther in # 2 and and Theo Dodunski in # 13 but it must be said that the handicappers now had Roly starting from a long way back. 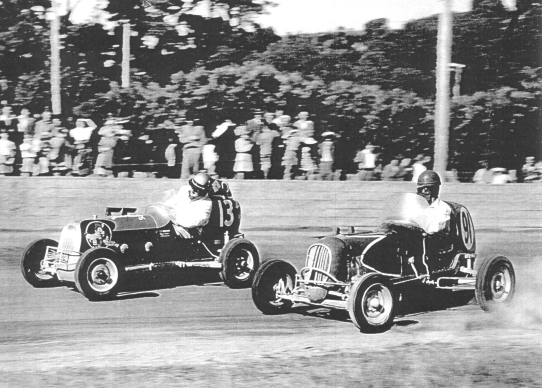 This shot shows Jack Burkett of the Manawatu in #44 leading John Arthur in #68 with Beau Thornton in #91 taking the long way around. Easter Monday. An attempt on the four lap record, held by Frank Collis with a time of 1 min 27 seconds, was the next task for Roly Crowther and once again he blasted round the Waiwakaiho oval at a breath taking rate posting a new time of 1 min 22 seconds. The Easter Handicap was the next event on the card and saw Bert Browne scurry home in the in # 39 car in heat one ahead of George Amor # 10 and Jack Lambie, as steady as ever in # 1, filling the third spot. Roly Crowther continued his good form of the night by winning heat two in # 2 from Theo Dodunski, who would advance to his second final of the evening, while third place was claimed by Bruce Boyd in # 4. Beau Thornton, perhaps overshadowed by the presence of Roly Crowther, was having a superb night at the wheel of the rapid # 91 car and was a comfortable winner of the third heat and was followed across the line by Frank Collis in # 60 and Ron Sutherland in # 31. The final produced a popular win for the crowd as George Amor in # 10 made the most of the back markers problems getting through the traffic to take the checkered flag ahead of a fast closing Roly Crowther and Theo Dodunski. An Invitation race for four selected drivers was easily won by Roly Crowther, Bert Browne held off Frank Collis for second, and a consolation race was won by Jack Harwood in # 19 from Bill Teixiera in # 22.When the cars were wheeled out onto the track for the ten lap feature and pushed to their handicap marks prior to the start it soon became apparent that Roly Crowther and the number 2 car would be giving away a good half lap to most of the field but when the starters flag fell the unassuming Auckland ace set a blistering pace, carving through the field at such a speed that those present were all on their feet and cheering their new idol on to a remarkable victory. Frank Collis produced another fine drive to finish second and George Amor claimed the third spot. The feature race brought down the curtain on yet another superb night of racing, Roly Crowther had been outstanding, Beau Thornton had battled gamely as had all the drivers and the happy fans could make their way home knowing it would all happen again in just two days time! Easter Monday dawned fine and clear and another huge crowd made their way to the show grounds for what was to be the first of many such family days at the Speedway. Details of Roly Crowthers exploits on Saturday night would have no doubt reached most corners of the Province and many would have come on the Monday to see the champion driver for themselves. Following his record shattering performances on Saturday night the club decided that they would have two sets of track records, one for Ford V8/60 powered cars, and another set for the four and six cylinder cars but it would prove to be only a temporary measure. Racing got under way with the running of the six lap heats of the Brooklands Handicap on a very slick and slightly dusty track.. Frank Collis continued his form from Saturday night and wheeled the # 60 car across the line ahead of George Amor in car # 10 and Jack Hinch in # 19 in the opening heat. Heat two brought out the crowds new favorite Roly Crowther in the # 2 car and it was another charge from the back victory for the Aucklander, from John Arthur in # 68 and Warwick Lewis in the ex Roycroft # 88. Rounding out the starters for the final were Beau Thornton in # 91 and Jack Lambie in # 13 who finished heat three ahead of Jack Harwood who was still sharing the # 19 car with Jack Hinch. Jack Lambie and Theo Dodunski had swapped cars for the day so Theo would be at the wheel of the # 1 car while Jack drove # 13. There were a number of match races spread throughout the program, George Amor defeated Bert Browne while Bruce Boyd in his # 4 was victorious over John Arthur in # 68 and in a special “grudge’ race Eric Bisset, the track manager defeated the club secretary George Bowen. 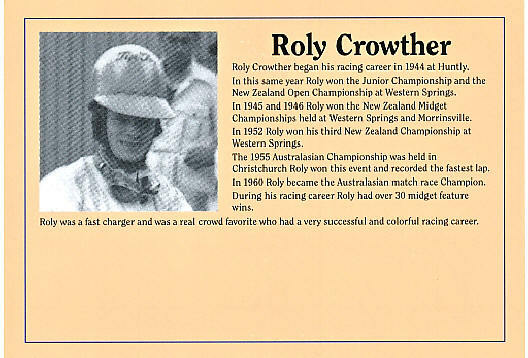 Photo on left is Rolly Crowther from Auckland in his V8-60 powered car. The heats for the Easter Handicap provided more exciting racing with Bruce Boyd scoring an excellent win over Jack Harwood and John Arthur while heat two brought together Roly Crowther and Beau Thornton who thrilled the crowd with their skill and daring before they crossed the line in that order ahead of Jack Lambie. There was no third heat as the car numbers were getting low owing to mechanical problems. In the final Roly Crowther had the V8 powered # 2 fairly flying as he carved his way through the field to take the win from Bruce Boyd and Beau Thornton, who, it turned out, was driving in his last meeting. A special handicap race was won by Bert Browne in # 39 from Frank Collis in one of Bert’s other cars, # 60 and Barry Wiseman, in # 68, won the novice race from Jack Lambie and Jack Harwood. The 10 lap Feature race closed the day’s action and it proved to be a real thriller. When the cars were pushed out to their respective handicap marks prior to the start, the spectators were astonished to see Roly Crowther’s car placed on a mark only twenty or so yards in front of the limit man. Surely even he couldn’t make up nearly a whole lap in a ten lap race? By this time of the day the track surface had dried completely and two days of racing had left it very slick, even out wide there was no cushion for the flying Aucklander to make use of the extra power his car produced. When the starter’s flag fell he set about reducing the handicap with a truly remarkable exhibition of driving, hurling his car sideways long before the corners, drifting up to the fence with apparent ease in the middle of the corners and shooting down the next straight gaining all the time on the front runners. He sat very upright in the cockpit of his car, driving it with no body movement at all and only the slightest movement of his arms and the car appeared to be on rails his driving was so smooth. Meanwhile a fair old scrap had been going on up front between the rest of the field and with one lap to go Roly was in traffic, ghosting past the other cars as time ran out. Approaching the finish line it appeared as if he might just make it but a fine drive from a handy mark saw Warwick Lewis in the # 88 (shown below), car scuttle across the line to win the race by a few feet. If Roly hadn’t won the Feature race well, at least he’d won the hearts of all those who had watched him perform over the Easter weekend, and he had created memories that would never fade, even with the passing of time. He had been brilliant! The club decided to run one more meeting after Easter which would make a total of nine meetings for the inaugrural season and again the public supported this move by turning out in large numbers. Missing from the lineup of local cars was Jack Lambies # 1 which had thrown a connecting rod through the side of the block while Jack had been doing a trial run on his own track at Pihama prior to the meeting. A number of Auckland drivers appeared on the program including Bill Teixiera who drove the # 23 car of Bert Browne, Feature winner from Easter Monday Warwick Lewis in # 88, Bob Leikis who was once again at the wheel of # 83 and a newcomer to Waiwakaiho, Phil " Zipper" Zainey who handled his own # 64 car. Phil Zainey had raced for a number of seasons at both Western Springs and the Olympic Stadium in Auckland and on his first visit to Waiwakaiho he had agreed to perform the stunt of driving his car through two fuel soaked flaming timber walls, one erected on the main straight and one on the back straight, during the course of the evening. Although this sort of stunt had been performed before the war by the great American daredevil Putt Mossman and his troupe at speedways throughout New Zealand it would have been a completely new experience for most of those watching at Waiwakaiho that night and was awaited with eager anticipation. Also making a welcome return were a number of the Manawatu drivers who had been absent for the Easter meetings, pre­sumably with commitments elsewhere, which boosted car numbers and created an excellent field for the nights' racing. Proceedings commenced with the running of the New Plymouth Handicap which was run in the normal manner of three heats and a final over six laps. John Arthur in # 68 scored a rare win in the opening heat and booked himself a start in the final as did George Amor who brought the # 10 car home in second place while Jack Hinch took third in # 19. Heat two produced a win for Theo Dodunski in # 13 while the # 57 car driven by Dave Holmes took second ahead of Auckland's Bob Leikis in # 83 and in the third heat the flying Fred Karlsson romped home in #30 ahead of Frank Collis in # 60 and Jack Harwood in # 19. The Final was won by John Arthur who drove a splendid race from a favorable handicap to secure the victory from Dave Holmes and the back marker for the event, Fred Karlsson, whose driving skills were much appreciated by the spectators. The four lap race for four selected drivers saw Frank Collis take a win at the wheel of Bert Browne's # 60 from # 44 driven by Jack Burkett of Wanganui while Jack Hinch finished third in # 19. At this point in the night's proceedings the two wooden walls were erected on the track for Phil Zainey to perform his stunt driving routine. Once they had been erected they were given a good dousing with an accelerant and ignited while Phil circled the track in his midget waiting for the signal to indicate that everything was set before charging through the walls and sending sparks and burning timber in all directions. The stunt was given a huge ovation from the appreciative crowd and it took some considerable time to douse the burning remains of the walls and get the track ready for racing again. Fred Karlsson continued his fine form by winning the opening heat of the Taranaki Handicap after a spirited tussle with Bruce Boyd in his # 4 car and Jack Hinch who clinched the minor places in that order. The second heat saw Auckland drivers Bill Teixiera in # 23 and Bob Leikis in # 83 claim first and second while Dave Holmes finished third. Frank Collis chalked up another win in heat three by storming home in front of Phil Zainey in # 64 and Theo Dodunski in # 13 and so all the finalists for the Taranaki Handicap had been established. A match race series between Dave Holmes and Bob Leikis saw the honors shared with each driver scoring a win. Phil Zainey proved he was more than just a stuntman by turning in a splendid drive to take out the final ahead of fellow Aucklander Bob Leikis and Frank Collis who could find no way to get past the leading drivers on this occasion. The meetings race for novice drivers was won by Fred Miles, the Wellington driver, in his # 15 car from Ralph Chadwick who drove Theo Dodunski's # 13 and Jack Burkett in # 44 while in the consolation race Jack Harwood defeated the only other finisher lack Burkett.. During the evening Bob Leikis and Dave Holmes had squared off against each other in a match race series which had resulted in a win apiece but before the third and deciding race could be run the heavens opened up and heavy rain brought the meeting to an early halt. It had been another night of spectacular racing which had produced exciting finishes without any serious accidents and the spec­tators made their way home well satisfied. That was how the curtain came down on the first season of midget car racing in Taranaki and what a season it had been. There had been many highlights, the visit of the incomparable Roly Crowther at Easter, Roy Low's dazzling form on Championship night. and the form of Fred Karlsson throughout the season were just a few. The ability of all the local drivers to mix it with the more established Auckland and Manawatu drivers had also been encouraging and with more cars promised for the next season it seemed that midget car racing in the Province would be here to stay. Another pleasing aspect was the way the club had had operated like a large family with everyone pitching in to keep cars run­ning when mechanical problems occurred. Often parts from one stricken car would be borrowed to keep another one running and everything was done in a pleasant atmosphere. Mention must be made too of the support that the club received from the Auckland and Manawatu competitors, in fact more different cars and drivers had appeared at Waiwakaiho during the season than had ever been seen at a single track in New Zealand and their support was invaluable. There were social gather­ings at the Kawaroa tearooms after the meetings where all the races could be rerun over a quiet flagon or two and visit­mg drivers would often stop overnight and have a run out at Jack Lambies Pihama track on Sunday afternoon. The Committee and all the club members could be justifiably proud of their efforts to run a first class speedway and the future looked full of promise with several new cars under construction and for all con­cerned the only question that remained was "what do we do now on Saturday night?"